A suitable site for a new Town Hall was found at Landport, at what had formerly been the residence of Sir Thomas Ridge, but was at that time the official residence of the Commander of Artillery. The design for the building was under the control of a sub-committee of the Council, the members of which greatly admired the architecture of the modern Town Halls in the North of England, particularly those of Leeds and Bolton. The latter had been designed by Mr William Hill who was appointed the Architect for Portsmouth. He copied many of the features from Bolton but made so many improvements that it was larger by some 412,000 cubic feet. Local Architect Charles Bevis in partnership with Hill directed the construction, Hill died before the completion of the building with Bevis adding to the design. 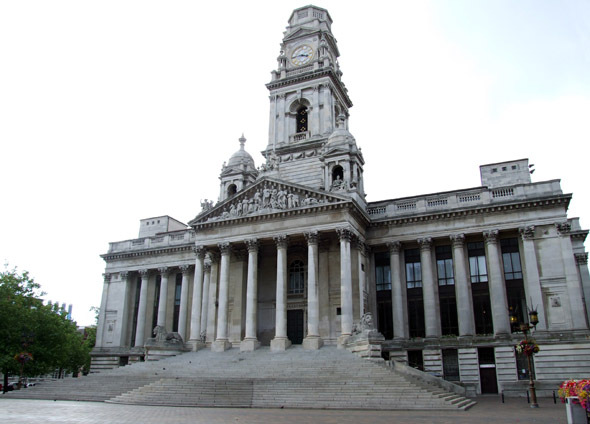 The building was originally called the Town Hall, but on 21 April 1926 it was announced that Portsmouth would be raised to the status of a city and the town hall was renamed the Guildhall. The lowest tender for the construction, which was carried out by Messrs. Armitage and Hodgson of Leeds, was £98,245. The Guildhall was opened by The Prince (later King Edward VII) and Princess of Wales on August 9th 1890. On the night of Friday, January 10th, 1941 three waves of incendiary bombs hit the Guildhall followed closely by a high explosive device. The building was gutted and took some weeks to cool down sufficiently to allow Corporation staff in to assess the damage. In practice there was little to evaluate as the building was reduced to a shell with just three external walls standing. The building was rebuilt after the war for £1.5 million, using war compensation funds. However, the interior was much changed from the original and the external style is missing much of its original ornateness, especially the dome above the clock and the roofline. “The foundation stone of this important new building is to be laid on the 14th of next month, and we herewith publish a double-page view of the design. Mr. Wm. Hill, F.R.I.B.A., of Leeds, is the architect of the work, which, in some points, is a replica of Bolton Town Hall, which was erected from the same architect’s designs some thirteen years ago, Mr. George Woodhouse, of Bolton, being joint architect with Mr. Hill. The authorities of Portsmouth municipality so admired the Bolton building as to at once select Mr. Hill as their own architect. A view and plans of the Bolton Town Hall will be found in the BUILDING NEWS for June 13th, 1873, and a comparison of the two compositions is very interesting. The improvements now introduced greatly enhance the architectural effect. At an early date we hope to be able to publish some drawings of the interior of the fabric, and may then give some plans with a detailed description of the building. Portsmouth is to be congratulated on the choice of so suitable a design for its new Town Hall, and we trust that it will be furnished and finished in a complete and suitable manner at a not far distant date.” As published in The Building News, September 24 1886.